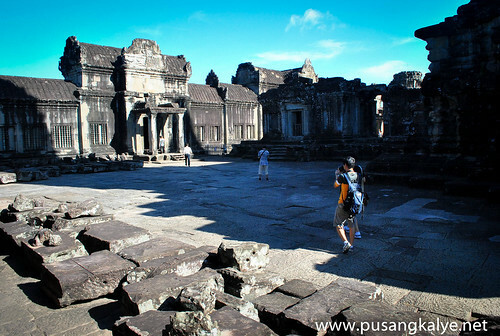 So here is the short summary of our day tour of Angkor Complex. HOW MUCH is the DAY TOUR? Bring your own food and drinks. Guides inside temples are optional for $2 per person.Perfect for groups. Tuktuks are everywhere so it's pretty easy.You can randomly call one and negotiate.As long as you don't go far from $20, that's ok. If you arrive at night (like we did) I would suggest you contact the tuktuk driver who will take you to your hotel.Especially if you are planning for an early departure for sunrise. and I can highly recommend him.He is nice and he will take care of you. Entrance fee for a single day pass is $20 per pax. 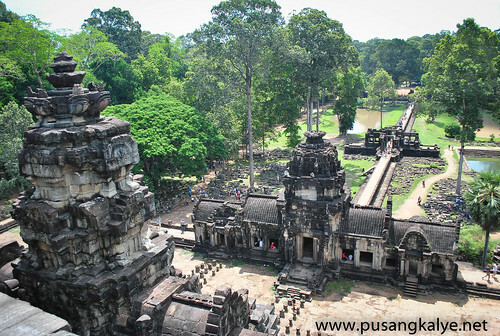 That includes all the temples in Angkor Complex. 1 to sawa! Ticket Office opens as early as 5am. Don't feel like cheating coz photos are taken on site and they are very efficient with the id system.Instant ID with your photo in less than 3 minutes. How I wish we can have that efficiency here. Ah.Angkor Wat! At last.To say that it was one of our most anticipated part of the trip would be an understatement.I was holding back the excitement since landing in Vietnam and being here finally is indeed a dream come true.I never felt lucky being a citizen of Southeast Asia.This region is amazing, and Angkor Wat and the whole Angkor Complex is Shockingly Amazing! I really find Angkor Wat photogenic in every angle (especially because we were there in the early morning) not to mention that being inside it,you feel how strong the structure is. BAYON TEMPLEon the other hand has a different appeal.From afar,you would find it a bit hard to make sense of what it is except for the impression that it is a giant structure of piled rocks.As you get closer though, the more you appreciate the intricate design and mysticism of the place. 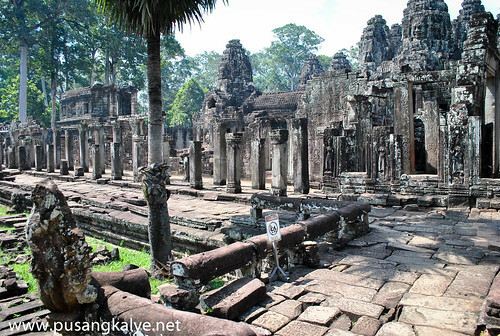 Bayon Temple is the most significant temple inside Angkor Thom which used to be the City with Angkor Complex.If Angkor Wat is where the Royalties live, it is in Angkor Thom where Royalties and ordinary people interact.Ito yung downtown kung baga. 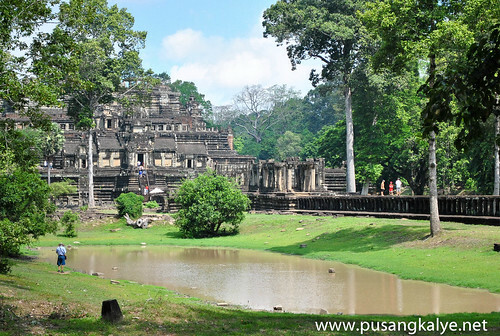 Angkor Thom actually means "Great City". 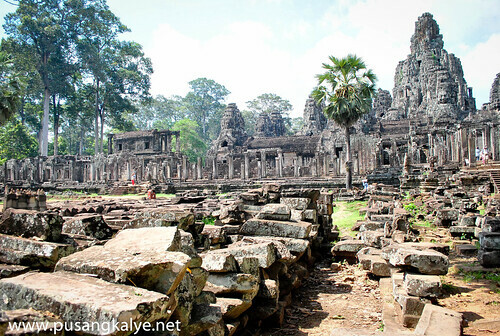 While the splendor of Bayon is difficult to match,Bapuon sits quietly proud in the same spot where it all started.This was the exact site that marked the center of the capital that existed (and apparently destroyed) before the construction of Angkor Thom. The long elevated walkway leading to it and the large open space in front of the temple makes for a grand entrance that goes with an elated feeling of excitement. Temple Overload? 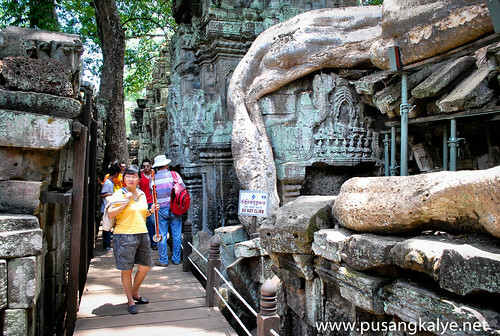 I thought I have seen enough.But there was still one that we would like to visit before ending our day tour of Angkor Complex ----TA PROHM. If it doesn't ring a bell. 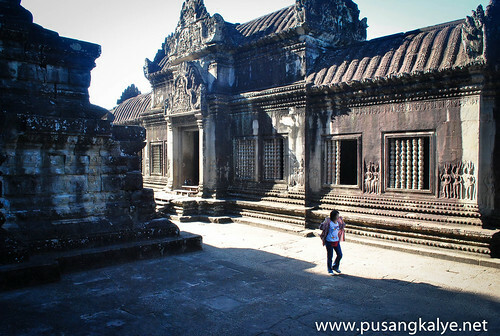 Ito lang naman yung temple na nasa Hollywood movie na "Tomb Raider" so people usually call it Tomb Raider Temple.Thanks to that movie starring Angelina Jolie, tourism arrival in Cambodia increased from 300 in 1999 to more than 2 Million in 2012.This is no secret of course. 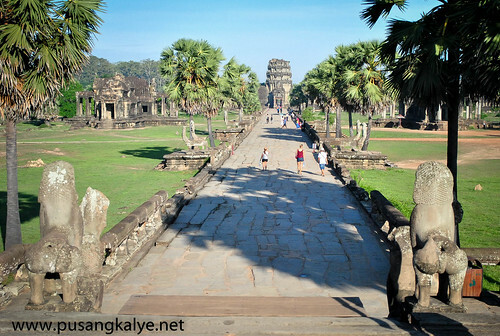 When approached by restaurant barkers in Angkor Wat,pretend as if you don't know how to speak English and not engage with them in any way.They could really get annoyingly annoying! 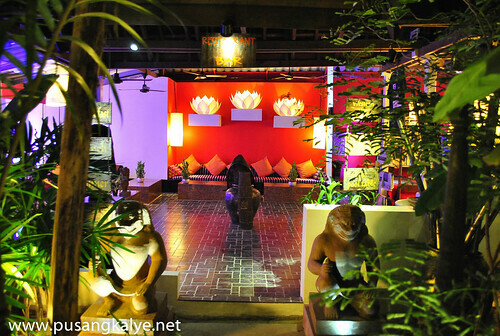 This is one small hotel with a big statement.It is a testament that small space is not a setback to accentuate a place.In front are so many plants that it feels like going through a small forest before getting to the building entrance and lobby.Inserted in the greens are Buddha statues and Khmer cultural symbols.The lobby is a pleasant space where you can feel that you are indeed in a different place----Welcome to Siem Reap! 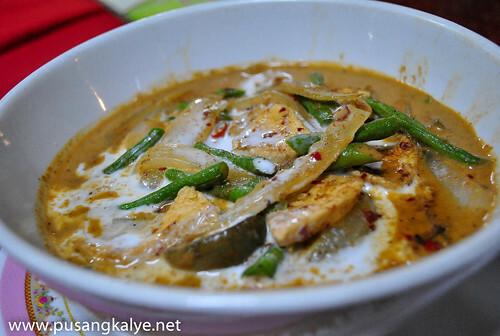 KHEMER SOUR SOUP, Cambodian Noodle w/ Curry at PAI SAN RESTAURANT Siem Reap. If it was mostly fish,fish ,fish in Phnom Penh, the food we had in Siem Reap were mostly meat.Pork,meat or chicken. I noticed that in this particular set that we ordered, there's a peculiar "coco-nutty" flavor. Not to mention the curry of course with its flavorful taste. Basil was still the major concern of my wife so we had a hard time looking at the menu for food that doesn't have any spirit of basil.A hard feat.She ended up with Fried Meat with Sweet and Sour which is simply, sweet and sour. 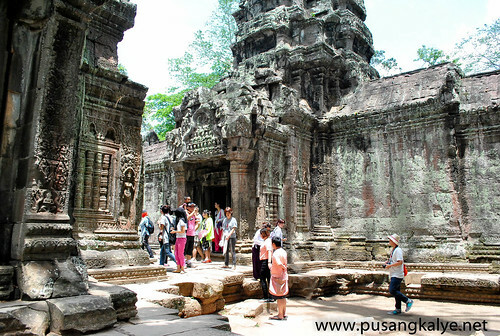 This is part of our Vietnam-Cambodia-Thailand 2013 Tour. Feel free to leave your comments or questions here if you have any. Hi! 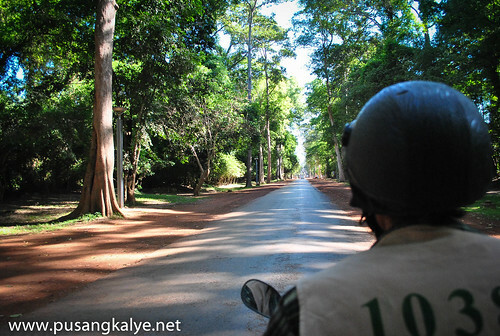 been following your posts as they are the most recent i can find online about thailand and cambodia. going to the two countries next month and i hope to see your itinerary and budget, if possible, before i leave. it would really be a big help.